Illustration of Indrani at Indra Sabha, Cave XXXII, at Ellora from James Burgess' 'Original Drawings [of] Elura Cave Temples Brahmanical and Jaina, IIII.' The spectacular site of Ellora is famous for its series of Hindu, Buddhist and Jain cave temples excavated into the rocky façade of a cliff of basalt. The works were done under the patronage of the Kalachuri, the Chalukya and the Rashtrakuta dynasties between the 6th and the 9th Centuries. Indra Sabha, Cave XXXII, is the largest of the Jain series and dates from the 9th Century, Rashtrakuta patronage. A simple gateway leads to a courtyard in which there is a monolithic shrine with a pyramidal roof. The cave is double-storey and is excavated in the rear of the courtyard. The interior of the cave has a columned mandapa or hall with niches on the three sides and the sanctuary in the middle of the back wall. 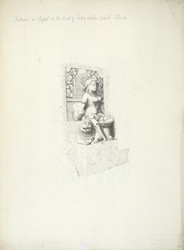 The sculpture in this view represents Indrani or Amba seated on a lion in a small cave in the courtyard.